“Ashes to ashes, dust to dust…” I’ve returned home this weekend to the East Neuk of Fife, I’m paying my last respects to Victoria Road Power Station in Kirkcaldy. The Category B listed building is in its final stages of demolition, peering through the security fence I can see its transformation is almost complete. Once a proud monument, venerated within the local community, the industrial relic has been reduced to a pile of unrecognized rubble; awaiting confinement to the history books. I remember wishing for the traffic lights to turn red every morning as I approached the Dunnikier Road junction in Kirkcaldy. Not because I needed that extra minute to compose myself en route to catch my early morning commuter train to Edinburgh, but to allow me a rubbernecking opportunity when I passed the old power station on the right-hand side of the road. A 7am start meant the morning was cloaked in darkness, the derelict building forever sat still with all the accoutrements of a haunted house. Broken windows, boarded apertures, gaping holes and vegetation sprouting from the external walls would often cast eerie shadows. But the eroding nature of the abandoned power station always permitted a teasing glimpse beyond its stone façade or through its fissured roof; just enough to ignite my inquisitive imagination of what lay beyond. 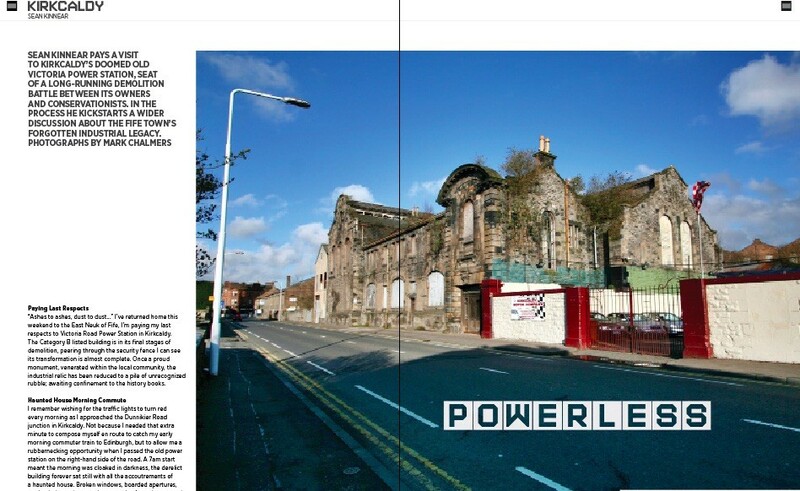 Back in 2013, Victoria Road Power Station was on the buildings at risk register, at the time extant with the protection of listed building status from Historic Environment Scotland. When I moved West to Glasgow in 2014 to finish my architectural training, I left my commuting days behind me. Although I would no longer nod at my architectural acquaintance, I maintained a romantic notion I would one day return to the Kingdom and adventure inside. I had naively assumed the statutory legislation would stand guard until my homecoming. However, in April 2017 the site was granted listed building consent for demolition. The Category B listing was not enough to save the power station from the impending bulldozers on this occasion; by now, queued out the gate. I had taken this piece of architectural heritage for granted. After existing for more than 100 years I believed its stubbornness would permit survival for another century. Once I heard the news the death sentence had been sanctioned, I made a final attempt at the 11th hour to visit the building prior to demolition, but to no avail. Unfortunately, the razing commenced within days. Although my efforts were futile, I found solace that this abandoned building had also caught the imagination of many likeminded urban explorers in previous years. 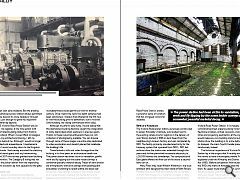 Thanks to these industrial enthusiasts there is a rich collection of photography available. You can browse through some of these images via online sites dedicated to urban exploration and derelict places that celebrate the building’s life. These fantastic stills and video footage show the building in its final years on architectural death row. The power station had been victim to vandalism, graffiti work and fly tipping but the scene inside conveys a somewhat peaceful material decay. Traces of slow erosion are omnipresent; walls and ceilings show peeling paint and plaster crumbling to reveal wattle and daub sub-structures. Steel railings, trusses, in-situ mobile cranes and riveted columns create a rich tactile dichotomy between the smooth stone and glazed bricks. 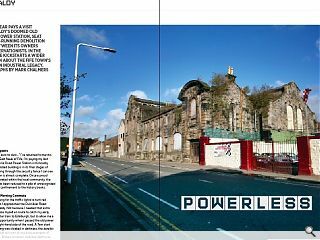 Victoria Road Power Station evokes a powerful sense of ruination that has intrigued visitors for decades. The Victoria Road power station, purposely constructed to power Kirkcaldy’s tramway, was located next to the existing railway line for logistics in the delivery of coal. Works started in 1899 on land feued from the neighbouring Linoleum factory and was completed by 1901. The facility primarily provided electricity for the tramway system that operated from 1903 – 1931, but archives show the station was extended through the years and further permitted household electricity to c.30,000 homes and streetlamps. The compound and East gable offered the final use of the site to a second-hand car lot. Many Fifers may recall William Williamson, the local architect who designed the main stand at Raith Rovers Football Ground in 1920 and oversaw the conversion of Forth Park House into a maternity hospital in 1933. He was also the talent behind the classically detailed Victoria Road Power Station. In its heyday it expressed a commanding street presence along Victoria Road, with Keystone windows, arched voussoirs, channelled quoin strips and projecting pediments; all the ingredients that would make any civic building stand proud. Archive photos show the building in its prime before falling into its disrepair, the main (South) façade presented itself very handsomely indeed. The historical importance of Victoria Road Power Station lay in the origins that Kirkcaldy was one of the first towns to have a municipally owned Tramway; initially legislated under the Kirkcaldy and District Tramways Act (1883). Before competition from buses emerged in the 1930’s the trams of Kirkcaldy were the pride of the town. An upper route stretched from Junction Road to Whytecauseway with the lower route between Gallatown and Links Street. The novelty of the new tramway saw 65,000 plus passengers within the first week, eventually totalling 2.7 million by the end of the first year. The demand for the avant-garde transport system saw the line extended to Wemyss and Dysart; despite the maximum tram speed being 8 mph. However, by 1922 the future of the system came into doubt and was further compounded in 1928 with the disrepair of the lines and frequent breakdown of tram cars. After anticipated costs of £100,000 were deemed too high for renewal and maintaining progress with buses, the last tram ran in 1931. The decommissioning process first saw the removal of the poles and overhead power cables, tram cars were re-used as summer houses, chicken coops and even placed in local public parks. 6.5 miles of tram lines remained in situ until the material demands of the Second World War requisitioned them for use as girders in the coal mines. With the Gallatown tram depot at Oswald Road demolished in the late 1980’s, the power station was one of the last remaining nostalgic links with the town’s tramways. The only surviving feature of the iconic transport system now is the category B listed viaduct on the Eastern approach to Victoria Road, spanning across the Den Valley. The last days of Victoria Road Power Station were not so utopian. Tracing back the local press coverage indicates the site had become embattled in its final years between the land owner and Fife Council. After restoration efforts were deemed too costly and complex, the threat of demolition hung over the building and the vultures circled. Feasibility studies and reports express the notion that repairing the building’s fabric and carrying out remedial works to the structure, including façade retention, were not “economically viable”. 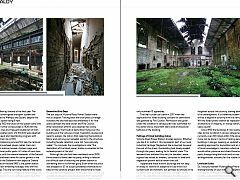 To conclude, the investigations note “the demolition of the listed power station is essential to the redevelopment of the site”. 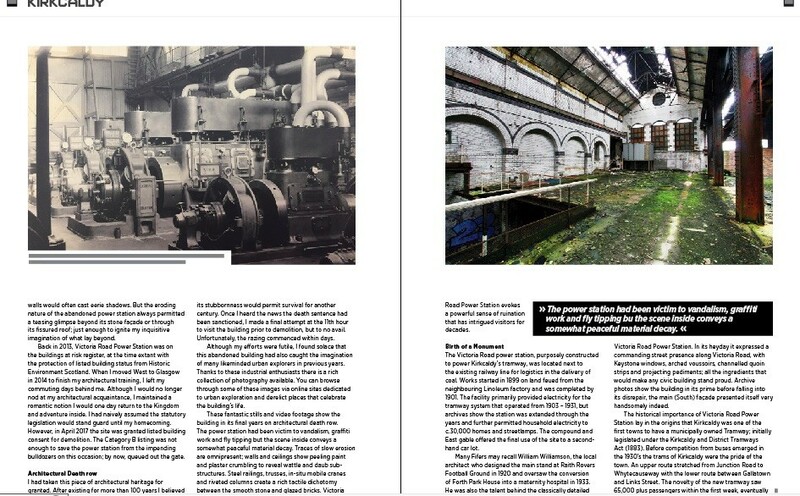 Although the site had been marketed since 2005 there seems to have been no party willing to take on the difficult task of restoring the power station to something akin to its former glory. Even when the price was dropped to £1 no buyers presented themselves to take on the sensitive project that would have to meet the architectural stipulations of HES and Fife Council. An earnest campaign to save the building from demolition was spearheaded through change.org in 2013, but this only achieved 13 signatures. The final curtain call came in 2017 when the application for listed building consent for demolition was granted by Fife Council. Permission was given under the condition a salvage plan was submitted for the ashlar stone, important fabric and architectural features of the building. Victoria Road Power Station divided opinion. Whether you like it or loathe it, this represents part of our local industrial heritage. Neglected, like a haunted house at the end of the street, the building had slowly eroded through the years, leading to its derelict state. The elements had battered this relic for decades, water ingress had rotted its timbers, corroded its steel and vegetation growth had all taken their toll. I appreciate these historic buildings are not easy or cheap to restore for adaptive re-use within our current built environment, but perhaps we should strive for better care of these dwindling reminders of the past? The demolition of a category B building sets a dangerous precedent for other industrial monuments forgotten across the country; staring down the barrels of re-development. It’s therefore prudent to ask if there will be a degree of scrutiny with the new proposals. Will the listed power station be replaced by good architecture of integrity, or merely satisfy a parking space quota? Since 1990 the buildings at risk register has listed sites across Scotland in various categories of risk; currently over 200 listed within Fife alone. Perhaps more can be done in terms of raising awareness to these buildings in danger, keeping us updated with structures awaiting approval for demolition and an overall increase of local knowledge to maintain collective memory. I would rather preserve and share these building’s proud pasts through tangible bricks and mortar instead of writing another obituary for the rubble club. 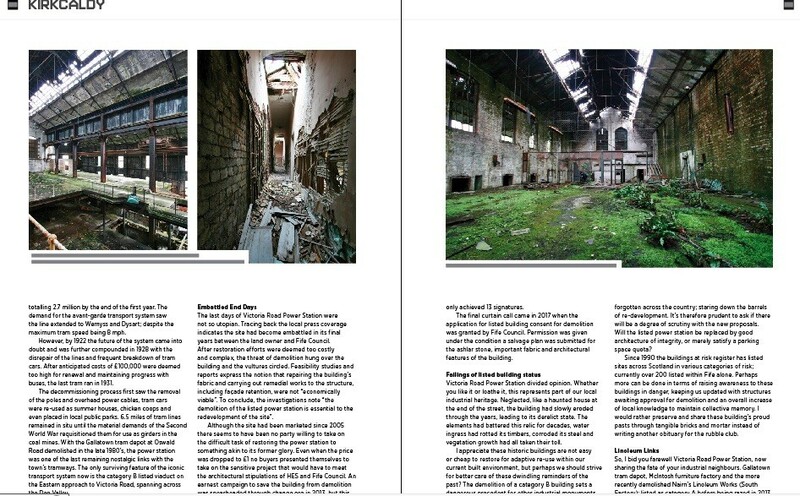 So, I bid you farewell Victoria Road Power Station, now sharing the fate of your industrial neighbours. Gallatown tram depot, McIntosh furniture factory and the more recently demolished Nairn’s Linoleum Works (South Factory); listed as category A before being razed in 2013.